The rise in e-cigarette popularity has previously been praised for helping nicotine addicts to quit their smoking habit - yet the debate about their long-term effects rages on. So-called vaping triggers cancer-related bladder tissue damage, a new study reveals, causing researchers to warn e-cigarette users that they may be putting themselves at risk of the condition. Some 92 percent of e-cigarette users' urine tested positive for two of the five compounds linked to bladder cancer, the research found. The finding contradicts a recent study that claimed e-cigarettes do not cause cancer at any nicotine dose. More than 9 million adults in the US and around 2.9 million in the UK use e-cigarettes. Electronic cigarettes are getting a generation of teenagers hooked on nicotine, a study has warned. Researchers claim that teenagers who would never normally smoke are now starting out with so-called vaping before moving on to regular cigarettes, risking long-term health problems. The study, published this January, was conducted by the University of California, San Francisco. The researchers found the number of schoolchildren who were smoking both cigarettes and e-cigarettes has risen between 2011 and 2014, suggesting that the trendy devices are a gateway to the harmful habit. The report’s authors said youths in the study who were deemed at a low risk of smoking cigarettes may not have developed a regular habit if e-cigarettes did not exist. Researchers from the Vanderbilt-Ingram Cancer Center in Nashville compared the urine of e-cigarettes users with that of nonsmokers. Most inhaled nicotine is excreted in the urine. The scientists looked for five known bladder cancer-causing chemicals that can be found in e-cigarette liquid. Results revealed that 92 percent of e-cigarette users tested positive for two of the five chemicals. In a second study, the researchers analyzed the effect of nicotine and its chemical compounds - including nitrosamines and formaldehyde - on DNA repair in cells lining the bladder. E-cigarettes were found to trigger cancer-related damage to bladder tissue. The research also revealed that nicotine, nitrosamines and formaldehyde block DNA repair, boosting the cancer risk. 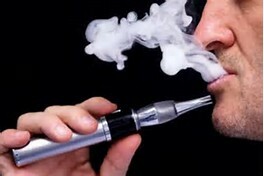 The researchers added that further research is needed to investigate the link between e-cigarettes and bladder cancer. Such findings contradict previous research from London-based British American Tobacco that revealed e-cigarettes do not cause cancer-related toxicities at any nicotine dose. The scientists exposed laboratory cells to the emissions of an electronic or standard cigarette. Results revealed that only traces of the normal cigarette collected in the cells and promoted tumor development.